Vicki Gwen Wade, 71, of Dunn, North Carolina passed away on August 24, 2018 at her home surrounded by her books. She was born on May 20, 1947 in Dunn, North Carolina, daughter of the late Edward and Gwendolyn Wade. She graduated from Cary High School, and received a Bachelor of Arts in English at Campbell University, and a Masters of Fine Arts in Theater from the University of North Carolina at Greensboro. 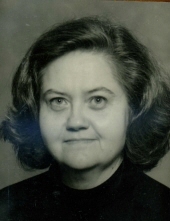 She was active with the Harnett Regional Theater for 41 years and was a board member for several years. Vicki was a teacher at Dunn High School and Cape Fear Christian Academy. She retired from the North Carolina Employment Security Commission as a Claims Specialist at the Dunn office. A memorial service will be held 11 a.m. Wednesday, August 29, 2018 at Skinner & Smith Funeral Home Chapel with Rev. Joe Sinclair officiating. A private graveside was held at Greenwood Cemetery. She leaves behind her sister Mary Catherine Berube and brother-in-law Mark Berube of Garner, N.C.; her cousin who was like a sister, Toni Turner Massey and husband, Dan of Hickory, N.C. and children Erin McElveen of Columbia, S.C. and Whit Massey of Banner Elk, N.C., and her best friend Amy Langdon of McGee’s Crossroads, N.C. The family will receive friends 10 -11 a.m. at the funeral home one hour prior to the service.Donations in Vicki’s memory may be made to Harnett Regional Theater, P.O. Box 1471, Dunn, NC 28335. To send flowers or a remembrance gift to the family of Vicki Gwen Wade, please visit our Tribute Store. "Email Address" would like to share the life celebration of Vicki Gwen Wade. Click on the "link" to go to share a favorite memory or leave a condolence message for the family.